What if learning these life-changing manifestation principles can be as easy as having afternoon tea? What if you can internalize in ten afternoons or less, what usually takes years of advanced spiritual practice to master? 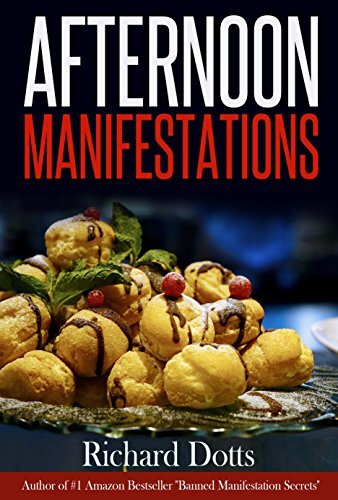 Join bestselling author and spiritual explorer Richard Dotts in his latest book Afternoon Manifestations, as he skillfully distills ten key manifestation principles which have taken him years to pick up into a series of straightforward afternoon lessons. Each chapter of this book revolves around an important manifestation concept, which if understood and applied, will allow physical manifestations to flow freely and more spontaneously into one’s life experience. (1) Does the Universe speak to us and send us impulses on what to do next? — Learn as Richard shows you how to accurately “receive” and act on Universal impulse for the fulfillment of your desires. (2) Realizing the secrets of the I AM teachings — There has been a recent renaissance of the I AM teachings and its application to the manifestation process. But few people understand how to apply these esoteric teachings to their lives in a practical way. Richard takes his readers through the actual realization of these magical teachings in one’s life. (3) Freeing ourselves from past manifestations — Are you still trying to re-create that one big manifestation that has occurred in the past with little success? Richard explains why it is important that we free ourselves from the baggage of our past manifestations and focus on creating from a brand new state. (4) Should we switch our intentions to something “smaller” and more achievable? — Richard’s take on this question will delight you, as he explains why the constant switching of our intentions to something smaller and more “believable” may actually delay rather than speed up the manifestation process. If you are interested in achieving a deeper understanding of these manifestation principles and wish to create from an infinite state of possibilities with each new day of your life, Afternoon Manifestations will be an invaluable guide along your spiritual journey.